Felicia Tan (left), a medical assistant, and Cindy Nothom, a registered nurse, in one of the exam rooms at the Culmore Clinic. The Culmore Clinic welcomed the community to its new quarters at First Christian Church on Leesburg Pike in Seven Corners April 9 at a dedication and ribbon-cutting event. The clinic, which provides basic health services to lower-income adults, had to vacate its former home at Columbia Baptist Church in Bailey’s Crossroads. That church needed to reclaim the clinic’s space so it could expand its preschool program. The ribbon-cutting for the clinic's new space at First Christian Church. “We’re still in the neighborhood, we’re still in Culmore, which is very important, as we’re within walking distance for our patients,” says Executive Director Allison Colby. The clinic is adding a third day of service. Healthcare providers will continue to see patients on Tuesdays and Thursdays. It will also be open on Wednesdays for medicine pickup, blood draws, and classes, Colby says. Because the new space is larger, clinic staff won’t have to spend as much removing and setting up their equipment, as they did in the previous location, she says. The clinic also upgraded its IT infrastructure, which will improve efficiency. Some of the most common ailments treated at the clinic are diabetes, obesity, and hypertension. Physical therapy and counseling are available at the clinic, too. As a result of the care provided by the volunteer physicians, physician assistants, and nurses, “patient outcomes are off the charts,” says Terry Lavoie, co-founder of the Culmore Clinic and former executive director. Over the last year, the clinic helped 64 percent of patients reduce their cholesterol and helped 54 percent lower their blood pressure. Counselor Karen Smith in the clinic's counseling room. “Under Allison’s leadership, we really understand how to serve the community,” Lavoie says. 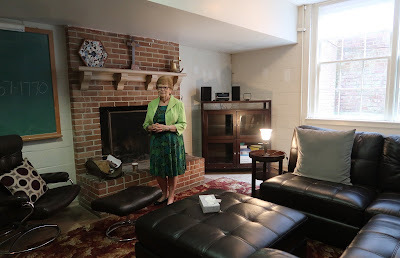 Karen Smith, one of the clinic’s counselors, says many people who come in are struggling with loneliness, isolation, stress, anxiety, or trauma. People with serious health problems are referred to specialists in the community, and several healthcare providers, including Fairfax Radiology and Inova, offer free or discounted services to clinic patients. The clinic partners with George Mason University to provide diabetes education. Among those who participated, 50 percent lost weight, and 50 percent lowered their blood sugar, Colby said. Patients have learned to make healthier eating choices and have access to the food pantry at Columbia Baptist Church. 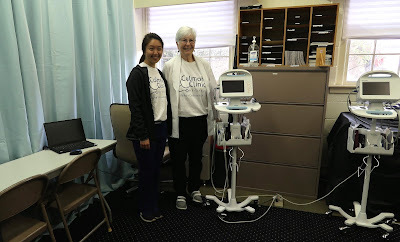 The clinic hosts nursing students from Marymount University and Shenandoah University who help patients with diet, exercise, medication management, and stress relief. The health services are free, although most patients contribute the $10 suggested donation. To qualify for the clinic, individuals must be under 200 percent of the poverty line, don’t qualify for Medicaid, and don’t have any other health insurance. “First Christian was excited and gracious to host us, as having a clinic is part of their mission to serve the community,” Colby says. The church also has the Safe Haven program, which serves breakfast and lunch, provides a safe indoor place, and a clothes closet for the homeless. The Culmore Clinic relies heavily on donations and volunteers. 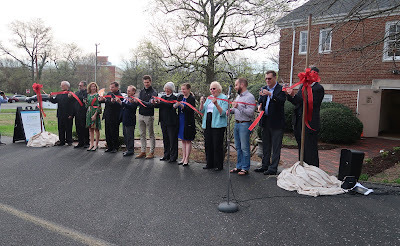 Many local companies, organizations, and individuals contributed funds, supplies, and labor to renovate the new facility. One of the nursing stations in the clinic is named for Julie Anne Kiley, a former Fairfax County public school teacher who also taught religion at St. Anthony of Padua Catholic Church, left $129,000 to the clinic in her will. Several students from Blessed Sacrament School in Alexandria who were at the ceremony had donated more than $300 to the clinic from their Dress Down for Charity Day.